Gkountela, S. and Clark, A. T. (2013). RNA-Seq Library Generation from Rare Human Cells Isolated by FACS. Bio-protocol 3(12): e791. DOI: 10.21769/BioProtoc.791. High throughput RNA Sequencing has revolutionized transcriptome analyses. However, most available protocols require micrograms of RNA rendering this technique not feasible for analyzing small numbers of cells, including precious rare cell types isolated from human tissues or organs. 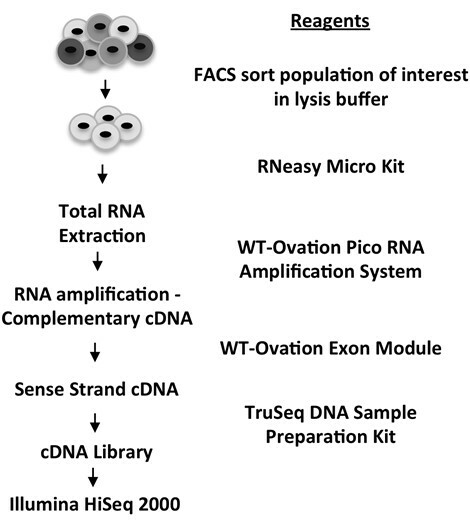 Here, we used an RNA Amplification System and describe a method for preparing RNA sense-strand cDNA libraries compatible with an Illumina sequencing platform starting from limited numbers of human fetal germ cells as well as human embryonic stem cells (hESCs) isolated using Fluorescence Activated Cell Sorting (FACS). With this protocol we generated seven RNA-Seq libraries starting from 4,000 germ cells sorted from fetal ovaries (n = 2) and fetal testes (n = 2) at 16-16.5 weeks of development and 4,000 sorted hESCs (n = 3). We predict that multiplexed libraries can also be generated by replacing the single-plex 3’ adapter used here with a multiplexing compatible 3’ adapter and indexed PCR primers. Sort 4,000 cells directly in 75 μl of RLT buffer (Qiagen RNeasy Micro Kit) using BD FACSAria cell sorter. Isolate total RNA from sorted cells using the RNeasy Micro Kit according to manufacturer’s protocol without the addition of β-mercaptoethanol to RLT buffer. Perform on column DNA digestion for 15 min according the manufacturer’s instructions using the DNase that is provided with the RNeasy Micro Kit and elute in 14 μl of RNase/DNase free water. Yield of total RNA using a NanoDrop 1000 ranges between 30-80 ng. Amplify RNA and generate cDNA with complementary sequences to the original mRNA using the WT-Ovation Pico RNA Amplification System according to manufacturer’s instruction. Expected yield of amplified cDNA measured on a NanoDrop 1000 is between 5-10 μg. A quality control step can be included at this point by performing Real-Time PCR for known transcripts that are expected to be present in the amplified cDNA pool. Generate sense-strand cDNA targets from 3 μg of complementary sequence cDNA using the WT-Ovation Exon Module kit according to manufacturer’s instructions. Sonicate 3 μg of sense-strand cDNA that is diluted to a final volume of 400 μl Tris-EDTA pH 8.0 buffer to generate cDNA fragments in the 200-500 bp range. Sonication with Sonic Dismembrator 550 and a 419 Microtip is performed on ice with six pulses of 20 sec each (magnitude setting of 3) and a 60 sec rest interval. Quantify sense-strand sonicated cDNA on a fluorometer using the Qubit HS dsRNA assay kit according to manufacturers’ instructions and aliquot 30 ng for generating the Sequencing library. Purify using the MinElute PCR Purification Kit according to manufacturer’s instructions and elute in 34 μl of RNase/DNase free water. Use all eluted cDNA in following step. Purify using the MinElute PCR Purification Kit according to manufacturer’s instructions. Elute with 10 μl of RNase/DNase free water. Purify the ligation reaction using the MinElute PCR Purification Kit according to manufacturer’s instructions. Size select the cDNA library by running the purified PCR product through a 1.5% Agarose Gel, cutting a smear in the range of 150-300 bp, purifying using the QIAquick Gel Extraction Kit according to manufacturer’s instructions and eluting with 36 μl of RNase/DNase free water. Note that DNA concentration is very low therefore there is no visible DNA band on the gel. Validate library by running the amplified DNA through a 1.5% Agarose Gel. The majority of the amplified cDNA should appear between the 150-300 bp range. Primer dimers and adapters appear at the 30-60 bp range. Purify library by gel extracting the DNA that appears in the 150-300 bp range using the QIAquick Gel Extraction Kit according to manufacturer’s instructions and eluting with 15 μl RNase/DNase free water (Figure 2). Quantify library final yield on a fluorometer using the Qubit HS dsDNA assay according to manufacturer’s instructions. The libraries generated using this protocol yielded between 200-700 ng. Figure 2. 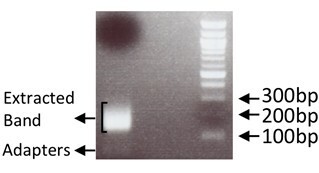 Example of gel extracted band alongside 100 bp ladder. Adapters visible around 30-60 bp. A quality control step can be included at this point by performing Real-Time PCR for known transcripts that are expected to be present in the generated library. If a quality control step was performed at step 3, before generating the library, the results should be similar. Run the cDNA library on an Illunina HiSeq 2000. Alignment statistics for all samples analyzed as well as correlation scores on the 3 replicates of hESC RNA-Seq libraries are shown in Tables 1 and 2. A.T.C. is supported by funds from the NIH/NICHD 2 R01 HD058047. Gkountela, S., Li, Z., Vincent, J. J., Zhang, K. X., Chen, A., Pellegrini, M. and Clark, A. T. (2013). The ontogeny of cKIT+ human primordial germ cells proves to be a resource for human germ line reprogramming, imprint erasure and in vitro differentiation. Nat Cell Biol 15(1): 113-122. How to cite: Gkountela, S. and Clark, A. T. (2013). RNA-Seq Library Generation from Rare Human Cells Isolated by FACS. Bio-protocol 3(12): e791. DOI: 10.21769/BioProtoc.791.